We're here to serve YOU! Professional Colorado Licensed Brokers, as well as Auctioneers and Appraisers! The Schur Success Team isn't one of the mega-offices with hundreds and hundreds of listings. Their goals are to have as many listings as possible. Well, we're different. If you have a home, ranch, mountain property, log cabin, or anything else that needs to be sold, our goal isn't to have the most listings. Our goal is to sell your property. We work with you. We want to establish a relationship with you. We don't subscribe to the "most listings win" theory. We subscribe to the theory that we need to earn your praise and referral. We measure our success not on the volume we sell, but on the recommendations you give to your friends. As a buyer, we'll take the time to work with you, find the properties that best meet your needs, and guide you through the complicated real estate transaction process. First and foremost, we listen. We listen to your needs and your wants. We listen to your concerns and your fears. Then we will search for not only what you're looking for, but whenever possible, reasonable alternatives to help you make sure you're making a good decision for you. If you're looking to sell, just call us. Though we're based in northern El Paso County, we are experts at ranch, farm, mountain, golf course, vacation, and all types of Colorado Lifestyle homes. We've sold across the state. If we aren't the right fit for you and your property, we have affiliates across the state, the country, and in fact, several other countries too. Trying to move to Colorado (and who can blame you? ), call us first - we can not only help you sell your place here or elsewhere, but we can help you buy just about anywhere too. On the other hand, if you're thinking of moving to Colorado, well then you found the right folks. Buyers typically don't even pay a penny for our services (the sellers usually do), so you'll not only get our personal, professional real estate services, but you'll probabbly get our services for free. Ask us for details and what a "buyer's agent" can do for you here in Colorado. We have a mix of folks here - native Coloradans and those who couldn't wait to get here. 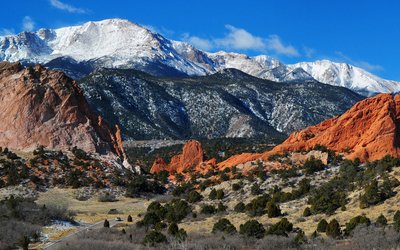 Being at the steps to Pikes Peak and ann the glory that is Colorado, we simply love being here. If you're into the outdoors, we have it all: horses, biking, hiking, skiing, snowshoeing, climbing, kayaking, white-water rafter... you name it, it cab be found here. We are surrounded by log cabins, and mountain retreats. By large, open farms and ranches, beautiful neighborhoods, stately mountains, bold rivers and quiet streams. Whether you want to live off-grid in a sustainable manner, or enjoy the urban and suburban feel, we can help you find what you want. We provide real estate services to clients, not zip codes. Tell us what you're looking for and we'll help you find it. We are based in Monument, Colorado, which is a unique town of 6,800 situated on the Rampart Range in northwest El Paso County. It is bordered by National Forest land to the west and the United States Air Force Academy to the south. Monument sits at an elevation of 7,135 feet and has an interstate in town with fast access to Colorado Springs and Denver. Our town is named for Monument Creek and the beautiful rock formations on the west side of the city. This is a great place to call home. We'd be happy to brag about it to you, and send you some great information about the area and the many benefits of living here. We are award-winning, champion, and Hall of Fame Master Auctioneers. That's right - we can do that "yabba-dabba-do" thing. It means we can help you sell your property or the stuff that's on or in your property, making us a one-stop shop if you're ready to move. Ask us about selling your real estate at auction. It's not for everyone or every property, but when the right factors are present, auctions are a tremendous way to achieve true market value for your property at an accelerated rate. Selling your home, your land, or your "stuff", we have multiple options designed to fit your needs. CALL US. We're nice folks, really. We'll answer your questions and give you some ideas. If it looks like we're the right company for you, then we can talk about contracts. Until then, we'll just enjoy meeting you and having a pleasant conversation. Our office is located right off of I-25, at exit 161 in Monument. We have a Kuerig - we'll gladly buy you a cup of coffee. Just stop in to say hello. We're here to help. Local Expertise with National Exposure. No one sells the country like United Country.